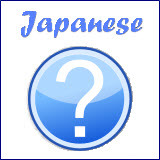 Sentence showing Japanese time expression can be formed using either Noun sentence or Verb sentence. You will learn how to form sentences showing time and some required particles in this lesson. 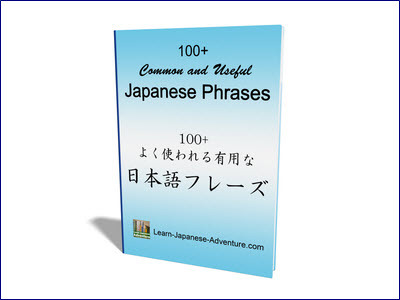 So far I have not touched on Japanese verbs yet, but I will give some examples using simple verb sentences. 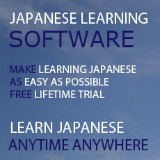 Please refer to Japanese lesson 18 and onwards for lessons on Japanese verbs and related topics. You should first take a look at the sections on Japanese time and Japanese Day Month Week to familiarize with how to read time in Japanese. Let's start with using Noun sentence to show Japanese time expression. Meaning: What is the time now in Topic? Meaning: What is the time now in Japan? Meaning: It is 3pm now in Japan. Meaning: What is the starting time for Topic? Meaning: What is the ending time for Topic? Meaning: What is the starting and ending time for Topic? The above expressions are best used to ask for the operating time for supermarkets, banks, clinics or works, etc. Meaning: The bank opens at 9am. Meaning: What is the time that your work ends? Meaning: My work ends at 5pm. Meaning: What is the operating time for the supermarket? Meaning: The supermarket opens at 10am and closes at 10pm. Meaning: What is the rest day for the bank? Meaning: The rest days for the bank are Saturday and Sunday. Similarly, to ask which month, you can say なんがつ (nangatsu). Meaning: When is your rest day? Meaning: When does the Topic start? Meaning: When does the Topic end? Meaning: When does the Topic wake up? Meaning: When does the Topic go to bed? Meaning: When is the lesson starts? Meaning: When is the lesson ends? Meaning: When do you wake up? Meaning: When do you go to bed? Point to note is that when using verb sentence for Japanese time expression, you must use the particle に (ni). However, there are certain time expressions where に (ni) is not required. See below (end of this page) for the lists. ... are some exceptions where the object is not required. Meaning: I eat breakfast at 7am every morning. Meaning: I drink 3 cups of coffee every day. Meaning: I do my washing/laundry every Wednesday. Meaning: I am going to watch movie tonight. Meaning: When do you go to Japan? Meaning: What is the date that you go to Japan? Meaning: I go to Japan on 2nd of August. The following 2 lists show those Japanese time expressions that require the particle に (ni) and those that do not require に (ni). 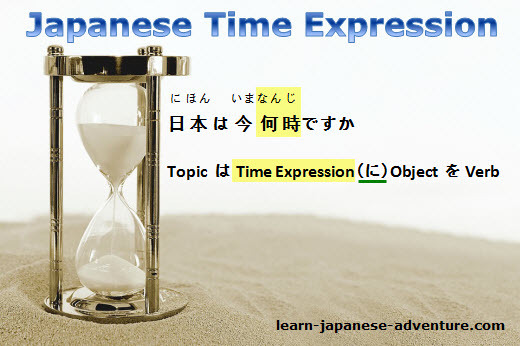 The above 2 lists of Japanese time expression are not exhaustive, but you should get the idea which are those that require に (ni).